A Kyrgyz cemetery seen from a distance is astonishing. The ornate domes and minarets, tightly clustered behind stone walls, seem at odds with this desolate mountain region. Architecturally unique, Kyrgyzstan’s dramatically sited cemeteries reveal the complex nature of the Kyrgyz people’s religious and cultural identities. Elaborate Kyrgyz tombs combine earlier nomadic customs with Muslim architectural forms. After the territory was formally incorporated into the Russian Empire in 1876, enamel portraits for the deceased were attached to the Muslim monuments. Yet everything within the walls is overgrown with weeds, for it is not Kyrgyz tradition for the living to frequent the graves of the dead. 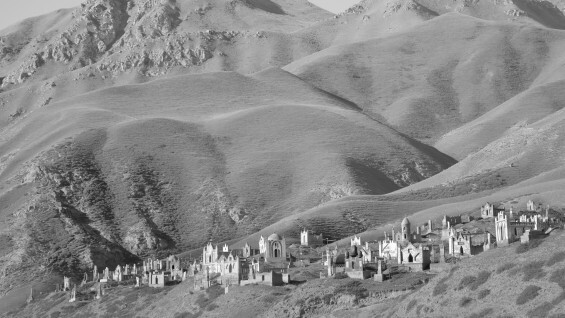 Traveling in Kyrgyzstan, photographer Margaret Morton became captivated by the otherworldly grandeur of these cemeteries. Cities of the Dead: The Ancestral Cemeteries of Kyrgyzstan exhibits the photographs she took on several visits to the area and is an important contribution to the architectural and cultural record of this region. Margaret Morton is professor of art at The Cooper Union. She is the author of four previous photography books exploring alternative built environments: Fragile Dwelling; The Tunnel: The Underground Homeless of New York City; Transitory Gardens, Uprooted Lives (with Diana Balmori); and Glass House. The publication Cities of the Dead: The Ancestral Cemeteries of Kyrgyzstan is being released by the University of Washington Press in November, 2014.